DID YOU LEAVE A DEPOSIT AT SECURITY CONTROL? Don't throw it away, send it by mail! 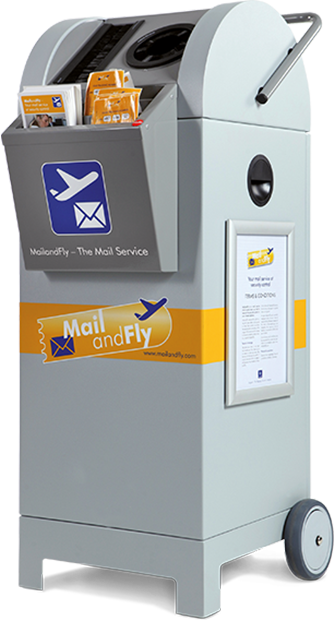 MailandFly is a mail service located directly at security control. You now have the choice whether to throw a prohibited item into the waste bin or into the MailandFly collecting container. When choosing the MailandFly service you receive an individual code that works as a tracking number. VIA internet you can now register to retrieve your item. MailandFly is a very efficient solution to recover your belongings as passengers can swiftly take all necessary action online. You decide on destination address, shipping/collection option and payment method after you flight. You have 42 days to reclaim your items from the date it was registered with us. A service that relieves all involved parties from stress and makes air travel more safe and enjoyable.